All of the leaves have fallen at my house. The yellows, browns, oranges, reds---they go so well with even the simplest of color schemes. What do you think of this outfit? I've got a 3-day week this coming week. One test on Tuesday and then I'm free of tests!! I plan to blog all four days of my weekend, so stay tuned for that. :) Also, does anyone still trick-or-treat? I know that' s next week, but I'm already thinking about it. I'm 17...and I still trick-or-treat. Candy is all ages, if ya ask me. Also--I'm on the lookout for a pair of brown leather (or faux leather) ankle/midcalf boots. If any of you have suggestions/recommendations/etc, please let me know! Finally--COSTUME IDEAS! I still need one for a costume party I'm going to next weekend! Does anyone have any cute/easy ideas? haha! I love that you still trick or treat. :) I usually go to parties for my church, but this year it'll include trunk or treating, which is awesome. haha! Love your outfit! And who doesn't love fall leave?! Haha, I've been looking at collegefashion.net for some Halloween ideas since they've got some cute and creative ones that are fairly easy to replicate. You should be grapes for Halloween. Just blow up some purple balloons and stick them to yourself. WOULDN'T THAT BE AWESOME THOUGH?! But really, I'm horrible at cool Halloween ideas. I hope you think of something! Maybe an Egyptian?? 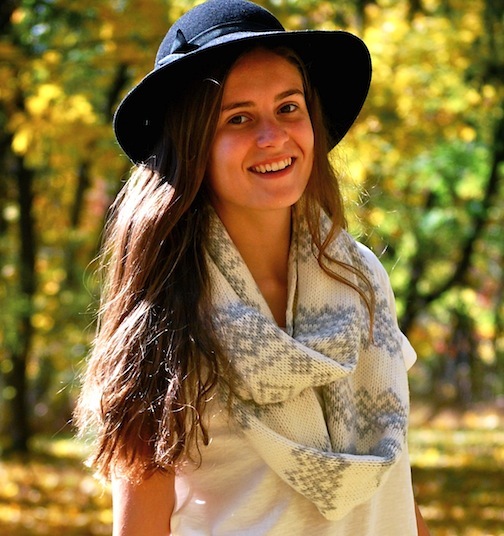 Oh I love that scarf and that hat - lovely fall look! i thought shopping for jeans/pants was easy for tall people. jeans/pants are usually too long on me and take me awhile to find a good pair. 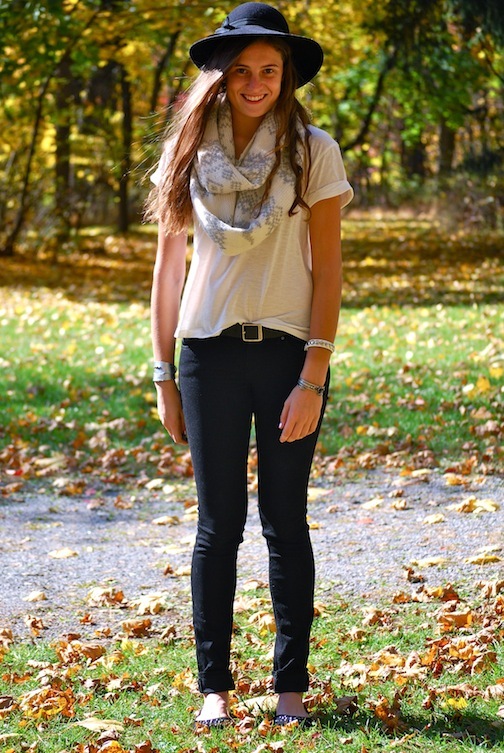 love your scarf and your studded flats! This is totally something I would wear. Also, i love love love halloween :) What are you dressing up as? also... i meant to comment on the hat, and your outfit and i how i love it, but then got side-tracked cause of my excitement for halloween. I think you'd make an awesome cat woman -- the anne hathaway version of this year's Batman, of course. Beautiful pictures, very fall-like! Love your scarf! Your hat adds a definite stylish touch to the outfit! You look fabulous is a hat doll! You also have such a STUNNING smile! Love your look! So simple and yet so well styled! That hat is so adorable! I want one like it! I so love your hat. It's such a statement that you can keep the rest of your outfit super simple. Love it! Cute!! Loving your hat and scarf Rory! Love that you're going to trick-or-treat! Candy is definitely for all ages girl! It looks so pretty your outfit with your background <3 Rory, this outfit is amazing for fall. Your scarf is wonderful! And for the halloween costume, i thing you would look amazing as Poison Ivy.